Autumn has been gorgeous so far. The colours in the hedgerows and garden are glorious reds, golds, limes and yellows and I'm still picking wild blackberries. Rooks and blackbirds have been perching in the very tops of the orchard trees and scoffing apples from the branch. The crab apples are excellent this year and a lot of jewel-coloured crab apple jelly has duly been made. Our flock of collared doves has grown and they spend a lot of time floating over the farmyard or sitting on the power lines in rows. We even had a heron in the courtyard garden. Which turned out to be less exciting when we realised that it had left a fish from the pond gasping on the path. We quickly put it back and threw some netting over the pond. The heron sailed away up and over the farmhouse roof back to the river, where I expect it had better luck. Patience Pig farrowed this month - a wriggly, very spotty litter of mainly girls. Her last litter was all boys, so you can never tell. True to her name she kept us waiting 8 days past her due date. She was quite happy, it was the rest of us that were pacing up and down. And checking every few hours for the first signs of her nesting. 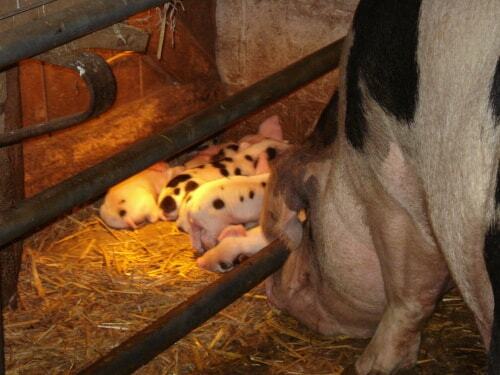 She's a very attentive mother and doesn't mind if a piglet clambers over her nose.